A short holiday in Denmark a couple of months ago presented an opportunity to tick off one of the places on my ‘bucket list’. Staying in Copenhagen, it was just a quick train ride westward to the old city of Roskilde, home of the Viking Ship Museum. The museum was opened in 1969 to house the remains of five Viking-Age ships that had been retrieved from the waters of Roskilde Fjord seven years earlier. They are commonly known as the Skuldelev Ships, having been found not far off the coastal village of Skuldelev, some 20 kilometres north of Roskilde. The five vessels had been scuttled – sunk deliberately – in the late 11th century. Their drowned hulls, weighed down with boulders, had formed a barrier across a narrow channel called the Peberrenden. In those days, Roskilde was a thriving market town, one of the most important settlements in Scandinavia and the main centre of Danish royal power. Its fjord gave access to the straits and seaways between Denmark and Sweden and ultimately to the Atlantic and Baltic trade-routes. But easy access left the town vulnerable to attack, hence the need for a barrier to restrict the approach of an enemy fleet. The barrier also enabled Roskilde’s rulers to exercise a measure of control over all ship-movements in the fjord. Map showing Roskilde Fjord as one of the branches of Ise Fjord. The hollow square indicates the area where the Skuldelev ships were found. After the end of the Viking Age, Roskilde continued to flourish. Its cathedral became a favoured resting-place for Danish monarchs throughout the medieval period and on into modern times. Many of the royal tombs are very impressive, an example being the sarcophagus and effigy of Queen Margrethe who died in 1412 (shown below). King Sweyn Estridsson, during whose reign the Peberrenden ship-barrier was made, is also interred in the cathedral. He died in 1076 and is often regarded as Denmark’s last true Viking monarch. Tomb of Queen Margrethe (died 1412) in Roskilde Cathedral. With the passage of time, the sunken ships in the Peberrenden channel began to disintegrate, dwindling to an underwater ridge of stones. Crews of fishing vessels plying the waters of the channel claimed to be able to see the ridge below the surface, but its origin and purpose were eventually forgotten. According to later folklore, the ridge was all that remained of a single ship that been scuttled in the early 15th century at the command of Queen Margrethe. This belief persisted until the late 1950s when archaeologists discovered that the ridge not only contained several ships but that it was created in the Viking Age. Section of Roskilde Fjord near Skuldelev, showing the channels (dark blue) and the Viking ship-barrier (red) across the Peberrenden. The task of bringing the fragile remnants of the Skuldelev vessels out of the water posed a significant archaeological and logistical challenge. The difficulties were overcome by driving iron sheets into the floor of the fjord to create a sealed area that could then be drained, allowing the waterlogged remains to be excavated. Needless to say, the work was delicate and painstaking. It involved the careful retrieval of thousands of timber fragments from what was essentially a mound of stones. The fragments were despatched to the Danish National Museum’s conservation department where they were treated with a special synthetic wax to prevent them from drying out too rapidly. The Skuldelev ships represent five different types of Viking-era vessel: two trading-ships, a fishing boat and two longships. They are numbered 1 to 6, in a sequence that omits ‘4’ (the reason for the omission is given below). Sixteen metres long and with a crew of 6 to 8, this ship was designed to carry trade-goods on voyages out on the open sea. It had decks fore and aft, with a space in the middle to serve as a cargo hold. Analysis of the wood indicates that the vessel was built in Sogn Fjord in western Norway sometime around the year 1030. Some two-thirds of it have survived. One of the planks, from near the prow, shows evidence of having been pierced by an arrow. At thirty metres long and nearly four metres wide, this is the largest of the five Skuldelev vessels. It is a classic Viking warship of the kind familiar to modern eyes from movies and TV dramas. The size of its huge sail has been calculated at approximately 120 square metres, giving a potential top speed of 20 knots (i.e. 23 miles per hour). Even today, with barely a quarter of its planks and timbers surviving, its sleek outline indicates that this was a fast and deadly craft. When not travelling under sail it would have been propelled by as many as 60 oars. It had a crew of 70 or 80 warriors who would have been commanded by a lord, perhaps a famous raiding-hero whose deeds were celebrated in song or saga. Unlike the other Skuldelev ships it was not built in Scandinavia but in Ireland, its wood coming from oak trees felled in the vicinity of Dublin in 1042. With a crew of no more than 5 or 6 and a length of only 14 metres, this ship plied the coastal waters off Denmark and would have been used for transporting a small cargo. Roughly three-quarters of it survives, the wooden fragments telling us that it was built in Denmark from local oak. Under sail it could have averaged a speed of 4 knots, but five oar-holes show that it could be propelled for short distances in the absence of a breeze. This is a kind of ‘ghost’ ship, having been mis-identified as a separate vessel before archaeologists realised that it was actually part of the great longship Skuldelev 2. This compact war-vessel was built in the Roskilde area c.1030, its makers re-using planks from other ships. Its crew of 30 may have been local farmers who were required to provide their own longship when summoned for military service by a lord or king. The places where they fixed their shields are still visible along the uppermost planks. In calm weather they would have hauled the 26 oars, this craft being one of the smaller types of longship with only 13 rowing benches. Originating in the same part of western Norway as Skuldelev 1, and built at around the same time, this small vessel of just over 11 metres in length is thought to have been used mainly for fishing before being converted to carry cargo. ‘Fishing’ can here be interpreted in its broadest sense, for the crew may have targeted seals and whales as well as fish. The main hunting grounds during this phase of the vessel’s life would have been deep Norwegian fjords rather than the open sea. The typical Viking ship was ‘clinker-built’, a method of hull construction using overlapping planks secured with nails. The overlap was meant to make the hull watertight, without the need for caulking with a sealant such as tar. Viking vessels were light and flexible, able to move in harmony with the waves, and this gave them the advantage of speed. Cross-beams and other structural timbers ensured that the hull kept its shape. A mast for the sail, a side-rudder, rowing benches and holes for the oars completed the design. Since the early 1980s, the programme of research at the Viking Ship Museum in Roskilde has included full-size reconstruction projects. Visitors to the museum may be lucky enough to see this work being undertaken in the adjacent boatyard. In keeping with the idea of ‘living history’, the modern shipwrights use Viking tools and techniques, in so far as these are known. Much is still unknown about how things were done a thousand years ago, so the task of reconstruction is a good way to recover this lost knowledge, as is taking the newly built vessels on sea trials in the fjord or out on distant waters. Reconstructed versions of the five Skuldelev ships can be seen in the harbour adjoining the museum. The images below give an idea of the stunning displays that await visitors to the Viking Ship Museum. I definitely recommend this place as a ‘must see’ for anyone making a trip to Denmark. Having visited once, in winter, I am all the more eager to return in summertime when the replica Viking ships and other reconstructions of medieval Scandinavian craft are moored in the museum’s harbour. Excursions take passengers out into the fjord where they can get an authentic taste of what it was like to make a sea-voyage in the Middle Ages. Skuldelev 1: the ocean-going trading ship (modern prow and metal frame, with original timbers). Skuldelev 2: the great longship. How the great longship might have looked in the 11th century: a model of Skuldelev 2. Skuldelev 2: the great longship and its miniature version. Skuldelev 3: reconstructed prow and original planks of the coastal trading vessel. Skuldelev 3: a modern metal frame supports the surviving timbers of the ship’s ‘skeleton’. Skuldelev 5: the small longship. Skuldelev 5: original planking attached to a modern framework and prow. Skuldelev 6: the fishing boat (or small cargo vessel). Skuldelev 6: close-up of the surviving planks and timbers. A model of Skuldelev 6. The Viking Ship Museum at Roskilde has a website and a Facebook page. This entry was posted in Places To Visit, Vikings and tagged Denmark, Vikings on April 15, 2019 by Tim. A number of places in the western midlands of England claim to have been founded by Æthelflæd, the Lady of the Mercians. One such place is Wednesbury, a town lying between Walsall and Dudley. Formerly in the old county of Staffordshire, Wednesbury is now part of the borough of Sandwell in the post-1974 metropolitan county of West Midlands. Wednesbury’s position in the West Midlands. Æthelflæd was the eldest daughter of Alfred the Great, king of Wessex from 871 to 899. She was born a year or two before her father succeeded to the kingship. Her mother Ealhswith was a Mercian noblewoman of royal ancestry, so Æthelflæd was half-Mercian by blood. At the time of her birth, the old kingdoms of Anglo-Saxon England were under relentless pressure from Viking attacks. Mercia had once been a large and powerful kingdom, its rulers holding sway across almost the whole of the midlands. But in the second half of the ninth century it was repeatedly ravaged by the Great Heathen Army, a raiding host said to have been comprised mostly of Danes. Indeed, by the mid-880s only a western rump of Mercia remained under English rule. Its steadfast ruler, Lord Æthelred, continued the fight against the Great Heathen Army. Competent in war, he became a redoubtable ally and trusted subordinate of King Alfred. His loyalty was duly rewarded when, sometime in the mid-880s, he received the hand of Alfred’s daughter Æthelflæd in marriage. Southern Britain in the early 900s. In the ensuing years, Æthelred and Æthelflæd sought to strengthen their lands against further Viking raids, as well as against the ever-present threat of assault from Wales. They built ‘burhs’ (fortresses and fortified settlements) in strategic locations across western Mercia, often at places that had been important to the kings of pre-Viking times. After Æthelred’s death in 911, Æthelflæd continued the burh-building programme and led the Mercian army on campaign, right up until her own passing in June 918. It is in this seven year period that Wednesbury claims to have been founded by her. Although its name is absent from the Mercian Register – a contemporary record of Æthelflæd’s career in which a number of her burhs are mentioned – this need not preclude a connection. The places named in the Register are unlikely to represent a complete list of all the burhs she founded or re-fortified. Mercian burhs founded by Æthelflæd: sites identifiable today. Wednesbury has a long history. The oldest known record of its name comes from 1086, when the royal manor of Wadnesberie was noted in Domesday Book. The name is Old English ‘Woden’s Fort’, recalling the paramount god of the Anglo-Saxons, a pan-Germanic deity whom the Vikings knew as Odin. Woden had been worshipped by the earliest English-speaking settlers in Britain during the fifth, sixth and early seventh centuries, before their conversion to Christianity. It is rare to find his name preserved in a present-day place name. That it survived at all in the post-conversion landscape might seem remarkable, until we note that he was not entirely abandoned by the Christian descendants of the early Anglo-Saxon settlers. Indeed, he was given a new role as an ancestor of kings, his name being included in royal genealogies compiled in the eighth and ninth centuries. Tracing descent from Woden seems to have become a matter of importance for the ruling dynasties of Mercia, Wessex, Northumbria and other kingdoms. Yet it did not compromise their rejection of paganism. The new, post-conversion Woden was not the powerful god of old but a less divine figure whose lineage was now linked to the Old Testament patriarchs Adam and Noah. St Bartholomew’s on Church Hill, Wednesbury. The fort of Woden that gave Wednesbury its name is often thought to have originated as an Iron Age hillfort on Church Hill, the high ground where the parish church of St Bartholomew now stands. No ancient fortification can be seen there today but, if it did once exist, it would have been an important feature of the local landscape in the centuries before modern urbanisation. In the 1700s and 1800s, faint remains of old earthworks were indeed said to have been visible on the hilltop. Such claims appear to be consistent with the results of an archaeological excavation undertaken a decade ago, when a large ditch was discovered. This feature seems to belong not to the pre-Roman Iron Age but to the early medieval period, the time of the Anglo-Saxons. It contained framents of pottery that have been dated to the eleventh century, perhaps within a hundred years of Æthelflæd’s death. This raises the possibility that the ditch was first dug in her lifetime, and that it formed part of a fortification that she herself ordered to be built (or rebuilt). If that was the case, then Wednesbury would be one of her unrecorded burhs. Any discussion of Wednesbury’s early history should also consider that of nearby Wednesfield, another small town lying 4 miles to the north-west. Both places share the same Woden– element in their names and, given their close proximity, it might be more than mere coincidence. Wednesfield, recorded in the late tenth century as Uodnesfeld (‘Woden’s Field’), holds a special place in the history of the Viking Age. In 910, it was the scene of a major battle in which the combined forces of Mercia and Wessex defeated a raiding-army of Danes from Northumbria. The same battle is also placed at Teotaheale or Totanheale, now the village of Tettenhall on the edge of Wolverhampton. Tettenhall lies only 3 miles west of Wednesfield, close enough for us to imagine a battle raging fiercely across the lands in between, with both places caught up in the fighting. Alternatively, the name ‘Woden’s Field’ might originally have referred to an extensive area of felde (‘open ground’) which encompassed Tettenhall and other settlements, including the one that became present-day Wednesfield. If this was the case, then ‘Woden’s Fort’ at Wednesbury might have been so named because it was an important location in the wider district of Woden’s Field, perhaps a prominent landmark. We should also keep in mind the slight possibility that Woden’s Field might have taken its name from Woden’s Fort rather than vice-versa. Geography of the Tettenhall/Wednesfield campaign, AD 910. And so we come back to Æthelflæd. In 914, according to the Mercian Register, she built a burh at a place called Eadesbyrig, usually identified as the Iron Age hillfort of Eddisbury in Cheshire. It is thought that she repaired Eddisbury’s ancient ramparts before installing a garrison of soldiers there. Perhaps she did something similar at Wednesbury, refurbishing a long-disused hillfort and turning it into a garrisoned stronghold? Placing a burh in such a location would have been consistent with her policy of strengthening her long frontier with the Danelaw (the part of England under Viking control). This frontier ran diagonally from the Mersey to the Thames and had divided the ancient Mercian lands since c.880. Proximity to the Roman road network was a key factor in Æthelflæd’s burh-planning and we may note that Wednesbury is close to the presumed line of a road running from the major highway of Watling Street. This route took a south-east alignment between the Roman forts of Water Eaton on Watling Street and Metchley near Birmingham, although its precise course in the Wednesbury area has yet to be confirmed. If the Lady of the Mercians did indeed build a burh at Wednesbury, what did she call it? One possibility is that it might be the unlocated Weardbyrig (‘Watch Fort’) that she built in 915 according to the Mercian Register. A more ingenious theory relates to Wednesfield and the great battle of 910. It has been suggested that the name ‘Woden’s Field’ might not pre-date the battle (as is often assumed) but could have been coined in its aftermath. As both legendary royal ancestor and erstwhile war-god of the Anglo-Saxons, Woden would have been an appropriate figure to invoke in commemoration of a great victory over the Danes. Following the same train of thought, ‘Woden’s Fort’ on Wednesbury’s Church Hill might likewise have acquired its name around the same time, by virtue of being a landmark in a large area that had recently been renamed Woden’s Field. Or perhaps ‘Woden’s Fort’ was coined by Æthelflæd herself as a suitable name for a new burh within Woden’s Field? Such musings might not be as idle as they seem. Some historians do indeed wonder if the Mercian soldiers who fought in the Tettenhall/Wednesfield campaign were led not by Lord Æthelred – who appears to have been seriously ill at the time – but by his wife. Did Æthelflæd subsequently devise the name ‘Woden’s Fort’ to mark not only the English triumph at Woden’s Field but also the part she played in it? Present-day Wednesbury has undoubtedly taken the Lady of the Mercians to its heart. Near St Bartholomew’s Church, a street called Ethelfleda Terrace preserves the Victorian form of her name, as does the nearby green space known as Ethelfleda Memorial Gardens. In the town centre, her image can be seen in public artworks created from stone and metal. At the main bus station she appears as one of two sturdy ‘caryatids’ supporting an arched gateway, while on nearby Holyhead Road she is depicted on a large mural as a spear-wielding warrior confronting a boatload of Vikings. There is no doubt that local people view her with affection, regardless of the uncertainty surrounding her connection with their town. Wednesbury bus station: sculptured arch supported by ‘caryatids’ (Æthelflæd on the left; a worker from the tube-making industry on the right). The Æthelflæd caryatid (see also the photo at the top of this blogpost). (above and below) Mural sculpture on Holyhead Road: Æthelflæd confronts Viking raiders. Finally, we may note that the dedication of St Bartholomew’s church is of interest in the context of an Æthelflæd connection. We know that she was keen to promote and develop the cults of Anglo-Saxon saints, especially Mercian ones, among the people under her rule. One such saint was Beorhthelm who, according to old tales, had lived in Staffordshire as a monk and hermit in the early 700s. He is also known as Bertelin, and this is the usual form of his name in present-day churches dedicated to him. Some of these churches can justifiably claim to have been founded in Anglo-Saxon times, examples being St Bertelin’s in Stafford (adjoining the parish church of St Mary) and the parish church of Runcorn, now dedicated to All Saints but formerly dedicated to Bertelin. Another alternative form of the saint’s name is Bartholomew which in some cases took over the original dedication. This is what happened at Runcorn, where St Bertelin’s church eventually became known as St Bartholomew’s before being re-dedicated to All Saints in the nineteenth century. Might a similar process account for the name of St Bartholomew’s at Wednesbury, with the dedication having replaced an older one to Bertelin? Stafford: the outline of St Bertelin’s Chapel beside the parish church. Stafford and Runcorn are two old Mercian towns that originated as burhs founded by Æthelflæd, in 913 and 915 respectively. The original dedications of their churches are thought to reflect her promotion of Bertelin as one of Mercia’s premier saints. It is even possible that both churches were founded by her to serve the inhabitants of the new burhs. At Wednesbury, we cannot – on present evidence – be certain that she played any direct role in the town’s foundation. Nevertheless, the dedication of St Bartholomew’s parish church is certainly worth noting, and the possibility that it was originally known as St Bertelin’s can at least be kept in mind. Medieval records mention a church at Wednesbury in 1210, a building that may already have been old at that time. Whether a church existed as far back as the early tenth century is a question that archaeologists might be able to answer in the future. Wednesbury is mentioned in my book Æthelflæd: the Lady of the Mercians as a possible Æthelflædan site and as one of the places where she is commemorated in public art. 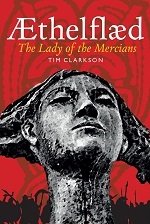 Further information on Roman roads, place-names and Anglo-Saxon settlement in the area containing Wednesbury, Wednesfield and Tettenhall can be found in David Horovitz’s meticulous work Æthelflæd, Lady of the Mercians; the Battle of Tettenhall 910 AD; and other West Mercian studies (2017). I’ve taken a look at the Anglo-Saxon history of nearby Wolverhampton in a recent blogpost on Lady Wulfrun. Lastly, a curious item of local news from Wednesbury. The original brass plaque in Ethelfleda Memorial Gardens was stolen some years ago, as reported in an article from the Express & Star newspaper. This entry was posted in Kings & queens, Sculpture and tagged Aethelflaed, Mercia, Wednesbury on March 26, 2019 by Tim. On the steps below St Peter’s parish church in Wolverhampton stands a fine modern sculpture of a woman in medieval garb. She stands proudly on a stone plinth, gazing out over the present-day urban landscape. A plaque on the plinth tells us that she is ‘Lady Wulfrun’ and that the sculpture, by Sir Charles Wheeler, was presented to Wolverhampton in 1974 to mark the centenary of the local Express & Star newspaper. The people of Wolverhampton regard Wulfrun as the eponymous founder of their city, the name of which is said to derive from Old English Wulfruneheantun (‘Wulfrun’s high settlement’). Little is known of her origins but we know that in the late tenth century she was a major Anglo-Saxon landowner with close links to the royal dynasty of the newly emerging kingdom of England. She is named as the beneficiary of a charter issued in 985 by King Æthelred the Unready in which she received a gift of royal estates in Staffordshire at Heantune (later Wolverhampton) and Trescott. The charter was witnessed by the leading figures in Æthelred’s kingdom, including the archbishops of Canterbury and York. Another charter, dated to 994, confirmed a grant of lands from Wulfrun to the church of Heantune to enable its re-founding as a college of priests. Unfortunately this document has been shown to be a fake, probably created in the eleventh century by the Wolverhampton clergy. It does, however, appear to incorporate older information on estate boundaries and may be based on authentic documents associated with Wulfrun’s ownership of local lands. She is shown holding this charter, represented as an unfurled scroll, in the sculpture beside St Peter’s Church. Stone inside St Peter’s Church commemorating the charter of 994. Stained glass window in St Peter’s, showing the charter of 994 being issued by Wulfrun to the clergy of ‘Heantune’. Wulfrun’s son Wulfric (known in later times as Wulfric ‘Spot’) became one of the richest landowners of the Late Anglo-Saxon period, holding lands not only in his native Mercia but in Northumbria as well. He received some of his estates as grants or bequests from his mother while others were inherited from his father whose name is unknown. Wulfric died sometime in the first decade of the eleventh century, leaving his lands to his daughter and other relatives. His will is one of the most important documents to come down to us from pre-Conquest England. The name of Wulfric’s father – Wulfrun’s husband – has long been a subject for speculation. Some historians think a likely candidate is Wulfsige the Black, an important Mercian nobleman, but others think Wulfsige may have been Wulfrun’s father. The little we know of Wulfsige suggests that he was a loyal henchman of Edgar, king of England from 942 to 975, from whom he received substantial estates in Staffordshire and Derbyshire. Some of Wulfsige’s lands were later held by Wulfrun before passing to her son Wulfric. If these people do indeed represent members of the same family, the estates may have simply passed down through three generations from father to daughter to grandson. Another of Wulfrun’s sons was Ælfhelm who served King Æthelred as ealdorman of Northumbria (based at York) from 993 to 1006. Ælfhelm was eventually murdered on the king’s orders, presumably for an act of treachery, and his two sons were blinded. However, his daughter Ælfgifu survived and, in 1013, she married the Danish prince Cnut. Seventy years earlier, Ælfgifu’s grandmother Wulfrun had herself come into close contact with Danes when she was kidnapped from Tamworth by Viking raiders from Northumbria. Tamworth may have been an important place for Wulfrun’s family, for her son Wulfric Spot bequeathed an estate in the area to his daughter and this could have been an ancestral landholding. Wulfrun depicted in a window at St Peter’s Church, Wolverhampton. One of the most intriguing theories about Wulfrun proposes that she was a grand-daughter of Æthelflæd, the Lady of the Mercians, via Æthelflæd’s daughter Ælfwynn. This would make Wulfrun a great-grand-daughter of Alfred the Great. At first glance, the idea seems to gain slight support from a medieval description of Wulfric Spot being of ‘nearly royal’ blood. However, the little we know about Ælfwynn suggests that she remained unmarried and childless, possibly having been forcibly confined as a nun after her mother’s death in 918. The chronology of Wulfrun’s life is uncertain. She might have been quite young, perhaps a teenager, when she was abducted from Tamworth by Danish Vikings. Four decades later, when she received lands from King Æthelred in 985, she was perhaps in her fifties. The Wolverhampton charter of 994, although spurious, might be correct in depicting her as still alive in the final decade of the tenth century. The date of her death is unrecorded but she might not have been long deceased when a charter of c.1005 refers to her as having taken ‘her last breath’. What, then, was her true ancestry? Rather than being an otherwise unknown descendant of Alfred the Great it seems more likely that she sprang from one of the senior noble families of central Mercia. Her kin may have obtained much of their wealth from estates bestowed as gifts by grateful kings in reward for loyalty and faithful service. At present, there is not enough data to connect her with Wulfsige the Black or with any other known figure of the tenth century. Wolverhampton’s Anglo-Saxon pillar: the shaft of a cross? Finally, we return to St Peter’s in Wolverhampton and to another monument in the churchyard: a tall sandstone pillar, somewhat weathered but displaying an array of sculptured animals and intricate patterns. Mystery surrounds its provenance and purpose but it has been tentatively associated with Mercian stonecarving of the ninth century, placing it a hundred years before Wulfrun’s time. If it is the shaft of a cross, as some observers believe, its existence would suggest that the St Peter’s site has been a focus of Christian worship since the 800s. In any case, it must have been a familiar sight to Wulfrun after she took ownership of the surrounding lands in 985. A display inside St Peter’s includes this scale model reconstruction of the Anglo-Saxon pillar. Here Anlaf broke down Tamworth and great slaughter fell on either side, and the Danes had the victory and led away great war-booty with them. There Wulfrun was taken in that raid. Older generations of historians, particularly in Victorian times, liked to make the names of Anglo-Saxon women look more feminine by sticking an ‘a’ on the end. Hence we sometimes see Ethelfleda (for Æthelflæd) and Wulfruna (for Wulfrun). This entry was posted in Sculpture and tagged Aethelflaed, churches, Mercia, Vikings, Wulfrun on December 8, 2018 by Tim. On the twelfth day of this month, at Tamworth in Staffordshire, a national service of commemoration was held to mark the 1100th anniversary of Æthelflæd’s death. A few days earlier, in Gloucester, a solemn procession conveyed a re-imagining of her funeral bier to the medieval ruins of St Oswald’s Priory. More events are scheduled to take place in the coming weeks, all of which will help to raise wider public awareness of the Lady of the Mercians. June has also seen the publication of my latest book – a biography of Æthelflæd that I mentioned here back in April when it was still in the pipeline. Like my other titles its publisher is Birlinn of Edinburgh who have issued it under their ‘John Donald’ imprint. The narrative incorporates my usual focus on political history with an emphasis on warfare. It considers the military campaigns not only of Æthelflæd but also those of her father Alfred the Great and of her brother Edward the Elder. Hence there are frequent mentions of battles, fortresses, treaties and alliances. But there is much more to Æthelflæd than the Anglo-Saxon warrior queen visualised in modern artworks. She was an educated, literate woman with strong religious beliefs. She had a keen interest in saints – especially Mercian ones – and actively promoted their veneration by establishing new cult-centres in various parts of her domain. She was also adept at what we now call ‘urban planning’ and has left her mark on the modern street-pattern in a number of west midland towns. At the end of the ninth century AD, a large part of what is now England had been conquered by the Vikings – heathen warriors from Scandinavia who had been attacking the British Isles for a hundred years. Alfred the Great, king of Wessex, was determined to halt the conquests but his death in 899 meant that the task passed to his heirs. In Wessex, his son and successor Edward continued the English fightback. So, too, did Alfred’s daughter Æthelflæd and her husband Lord Æthelred, rulers of the old kingdom of Mercia. After Æthelred’s death in 911, Æthelflæd ruled on her own, leading her army on a series of campaigns to recapture lost territory. Known to history as the Lady of the Mercians, she earned a reputation as a competent general and was feared by her enemies. She helped to save England from the Vikings and is one of the most famous women of the Dark Ages. This book, published 1100 years after her death, tells her remarkable story. Early chapters include an introduction to the documentary sources as well as a summary account of Anglo-Saxon history up to the ninth century. These are followed by the main narrative which deals with the life of Æthelflæd from her birth and childhood up to her mid-teens, then through roughly 25 years of marriage to the period of her widowhood. The penultimate chapter looks at the immediate aftermath of her death in 918, when her daughter Ælfwynn briefly succeeded as the new ruler of Mercia before being deposed. In the final chapter, Æthelflæd’s historical significance and her modern role as a subject for the creative arts are discussed. Notes for each chapter point the reader to primary sources and secondary works, all of which are listed in a 10-page bibliography. The middle of the book contains a plate section of 15 black-and-white photographs, while the main narrative is interspersed with maps (mostly relating to military campaigns) and plans of burhs (fortified settlements). Available in paperback from Amazon UK and Amazon USA or direct from the publisher. This entry was posted in Kings & queens and tagged Aethelflaed, Vikings on June 29, 2018 by Tim. This year sees the 1100th anniversary of the death of Æthelflæd, the Lady of the Mercians, who died at Tamworth in Staffordshire on 12 June 918. Æthelflæd is one of the most important figures in early English history, yet her story is rarely told. Although she is remembered and commemorated in the areas she once ruled – the west midland counties of England – wider recognition of her achievements is sadly lacking. Many people hope that this will change in 2018. Æthelflæd’s father was Alfred the Great, king of Wessex, whose long struggle against the Vikings was reported in the Anglo-Saxon Chronicle and other contemporary texts. While still in her teens, Æthelflæd became the wife of Alfred’s staunch ally Lord Æthelred of Mercia, a man who held the power of a king but not – as far as we can tell – a royal title. After Alfred’s death in 899, Æthelflæd and her husband maintained the Mercia-Wessex alliance. They joined her brother King Edward in recovering territories lost to the Danelaw – the eastern part of England that had been conquered by Viking armies. Lord Æthelred died in 911 but his authority passed to his widow who became known as the Lady of the Mercians (Old English: myrcna hlæfdige). Under her rule, Mercia recovered its former status as one of the major powers of Dark Age Britain. This was an era of kings and warlords, a period when female rulership and generalship were almost unheard-of, yet Æthelflæd proved herself adept in both roles. The final chapter of her story was equally remarkable: she was succeeded not by a man but by a woman – her daughter Ælfwynn who, if only for a brief time, ruled the Mercians as their new hlæfdige. Updates on my book will appear on this blog in the next few months. In the meantime, here’s a preview of the cover. It shows an image of Æthelflæd from a public artwork at Runcorn in Cheshire, one of the places where she established a burh or fortified settlement in the early years of the tenth century. This entry was posted in Kings & queens, Warfare and tagged Aethelflaed, Mercia, Vikings on April 4, 2018 by Tim. The Cumberland and Westmorland Antiquarian and Archaeological Society has recently made the full text of its Transactions available online. All volumes of this highly respected journal from 1874 onwards have been digitised, with all except the past 10 years being freely accessible and downloadable to non-members. The Transactions (often abbreviated as TCWAAS) is published annually. Each volume contains a number of articles on the history and archaeology of the present-day county of Cumbria. The online archive can be searched by keyword, not only in the title but in the body of the article (a very useful facility). Words can also be excluded from the search, thus eliminating unwanted articles and making the process quicker and more specific. TCWAAS is a valuable resource for research on the kingdom of Strathclyde because it deals with a region that formed the kingdom’s southern province in the tenth and early eleventh centuries. The county name ‘Cumbria’ preserves a Latinised form of the name of the kingdom itself, i.e. the land of the Cumbri or North Britons. Cumbria, realm of the Strathclyde Britons, c.900 AD. A search of the TCWAAS archive turns up a treasure trove of information on the period when substantial territories south of the Solway Firth were ruled by ‘Cumbrian’ kings whose headquarters lay on the Clyde. The following list of articles is just a selection. 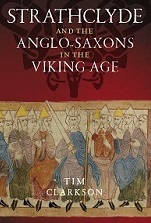 It includes items that I consulted while writing my book Strathclyde and the Anglo-Saxons in the Viking Age. Topics range from the origin and meaning of the name ‘Cumbria’ to the cultural affinities of sculptured crosses and other monuments. The list gives the title, author, volume, year and pages. Late Victorian image of one of the Lowther hogback fragments. To access the TCWAAS archive, click on the link below and then select ‘Transactions’ from the homepage. This entry was posted in Research, Sculpture and tagged crosses, Cumbria, hogbacks, Lowther, Penrith on August 27, 2016 by Tim. In Chapter Five of Strathclyde and the Anglo-Saxons in the Viking Age, I suggested that the battle of Brunanburh (AD 937) might have been fought somewhere in North Lancashire. I specifically highlighted Amounderness, the district between the rivers Lune and Ribble, as a possible ‘conflict zone’ containing the battlefield. Amounderness was a possession of the West Saxon king Athelstan, who granted it to the Archbishop of York in 934. Athelstan had previously purchased the territory for a considerable sum from landowners who were most likely of Viking stock. I take the view that Amounderness was the most northwestern part of Athelstan’s ‘England’ at the time of the battle of Brunanburh. Beyond it lay Lonsdale – the valley of the Lune – and the future county of Westmorland (which I suspect was under the authority of Anglo-Scandinavian lords who answered to York rather than to Athelstan). Beyond Westmorland lay the southernmost territories of the ‘Cumbrians’ or Strathclyde Britons, whose king led one of the allied armies that faced Athelstan in 937. A couple of sites within Amounderness have names similar to those attached to the battle by tenth-century chroniclers (Brunanburh, Brune, Brunandune, etc). One is Bruna Hill near Garstang, to which I pay special attention in my book, while another is Bourne Hill, near Thornton on the Fylde. The map below shows North Lancashire in the tenth century, with these two sites marked as green squares. Also shown are Roman roads, major rivers, the ecclesiastical centres at Heysham and Heversham, the Roman forts of Lancaster and Ribchester, and the presumed Anglo-Saxon burh at Penwortham. The case for Bourne Hill has recently been re-stated by Mick Deakin in a paper that I recommend to anyone who has an interest in the Brunanburh campaign. Mick has been researching the geographical context of the battle for several years and has amassed a large amount of data. Having no axe to grind for a particular location he is able to approach the topic objectively, keeping an open mind and not fixating on one particular site. Like many people (including myself), he sees a number of flaws in the currently popular view that the battle was fought at Bromborough on the Wirral Peninsula. He has also considered the case for an east-of-Pennines location and remains unconvinced, in spite of strong arguments being put forward by Andrew Breeze and Michael Wood. In past correspondence with Mick I’ve tended to show scepticism towards the Bourne Hill theory. My initial instinct told me that the Fylde seems too far west, too far from the beaten track (i.e. a major road running north-south) to be the conflict zone of 937. Having perused Mick’s paper a few times, I’m now inclined to be less sceptical. In fact, Mick identifies the main weakness in the case for Bruna Hill, a site that I must admit to feeling quite enthusiastic about after visiting it last year. Update: October 2016 – Mick’s paper “The Quest for Brunanburh: The Fylde and the Hidden Identity of Bourne Hill” was originally linked from this blogpost but the link is no longer active (i.e. the paper is no longer available at Mick’s page on Academia.edu). This entry was posted in Warfare and tagged Athelstan, Brunanburh, Vikings, West Saxons on July 8, 2015 by Tim.